Dr. Doris Trauner is Professor of Neurosciences and Pediatrics at University of California, San Diego (UCSD) School of Medicine, and Chief of Pediatric Neurology at UCSD and Rady Children’s Hospital San Diego. She received her medical degree at the Medical College of Virginia/Virginia Commonwealth University, and completed a pediatrics residency at UCSD Medical Center and a child neurology fellowship at the University of Chicago. She is board certified in Pediatrics, in Neurology with Special Competence in Child Neurology, and in Neurodevelopmental Disabilities. Dr. Trauner’s research efforts focus on cognitive development and disorders of brain development. She studies language and cognitive outcomes in children with perinatal stroke, as well as in children with specific language impairment, autism, and other neurodevelopmental disorders. Earlier in her career her research involved elucidating the pathogenesis of Reye syndrome and improving treatment for that condition. She has published over 140 original research papers, 38 chapters, and 2 books. 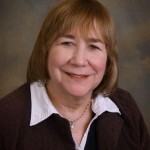 Her work has been recognized with numerous awards, the most recent of which include a Lifetime Achievement Award from the National Reye Syndrome Foundation in 2010, and election to Alpha Omega Alpha Medical Honor Society by Virginia Commonwealth University/Medical College of Virginia as a distinguished alumna in 2012. Dr. Trauner has served on a number of national committees, including as Chair of the American Academy of Pediatrics Section on Neurology, Chair of the Scientific Program Committee of the Child Neurology Society, and Councillor for the Child Neurology Society. She has also served on several NIH study sections and on the medical advisory committees of a number of foundations, including the Cystinosis Research Foundation and the Cystinosis Research Network. She is an active clinician specializing in neurodevelopmental disorders, and has been named in the top 1% of Top Doctors in America by US News and World Report, as well as in the Castle-Connelly list of Top Doctors in America for many years. Developmental language disorders (DLDs) – also called Specific Language Impairment (SLI) – include a group of conditions that cause a child to have difficulty speaking or communicating in a typical manner. Some children with DLD have problems with understanding what other people mean when they are talking. This problem occurs in children with normal intelligence and normal hearing. In the most common situation, DLDs appears in the first 2-3 years of life when a child is delayed in talking compared to other typical children their age. DLDs are common. They may occur in up to 10% of children, although estimates of how often this condition occurs vary from 1-11% of children. It is more likely to occur in boys than in girls by a ratio of 2-3 boys for every girl diagnosed with this condition. Many people confuse “speech” and “language”. Speech is the verbal production of language; that is, the act of saying words. Language is the conceptual process by which a person is able to understand what others say and also to communicate using words. A person can have language without speaking, but it is not possible to speak meaningful words without language. Stuttering is a speech disorder; the person knows what they want to say but can’t say the words fluently. Aphasia is a disorder of language; the person cannot formulate what they want to say and therefore cannot fluently express their ideas (expressive aphasia). If the person has difficulty understanding language conceptually, even though they have normal intelligence, they are said to have a receptive aphasia. Developmental Language Disorders (DLDs) are neuro-developmental disorders. They are present from very early in life and are caused by a difference in the way the brain develops with regard to language. The problem may be isolated and only affect language. Some children have other challenges as well, including attention problems, clumsiness, and academic problems when they get to school. There is a range of severity. Some children are slow to talk but appear to catch up by 4-5 years of age. These children may go on to have learning challenges, particularly dyslexia, or difficulty learning to read. Others are late in talking and do not catch up, but continue to have problems with either understanding other people when they speak or in speaking adequately themselves. When this happens, children can become shy and somewhat reluctant to talk in front of others because they realize they can’t express themselves as well as their playmates. A third type of DLD can occur in which the child begins to talk at the expected age, but language fails to develop at the typically expected rate. The diagnosis can be missed in these children because their early language seems normal. Children with DLD do not get worse as they get older; in fact, most improve, especially with support services (see Therapeutic Intervention section below). There is no laboratory test to diagnose a developmental language disorder. Disorders of language are diagnosed by a clinician, such as a physician or speech pathologist, based on a delay in starting to talk at the expected age. 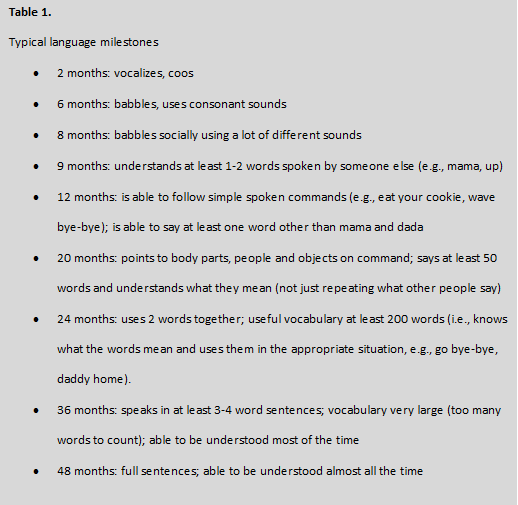 Table 1 outlines normal language milestones. If a child is not using words or sentences at the typical age, or is using words in an unusual way (such as only repeating what others say and not forming any words on his own) then a language disorder may be suspected. There are many standard tests that can be used to test both whether the child understands spoken language and whether the ability to speak is within the normal range for age. These are usually administered by a speech pathologist. Two of the most widely used are the PLS-5 and the CELF-Preschool or CELF-5. Both of these tests are very comprehensive and test different aspects of both understanding language and speaking. CELF-Preschool: The Preschool Edition tests children between 3 years and 6 years- 11 months. CELF-5: For older children, the CELF-4 or CELF-5 is used to test language between 5 years and adults up to age 21 years 11 months. These tests yield a standard score and an age-equivalent score. These scores help parents understand if their child is behind in one or more areas of language compared with other children their age, and by how much they are delayed. 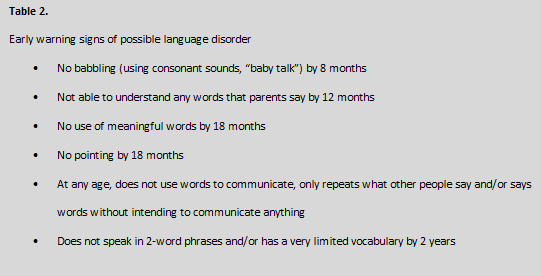 Table 2 lists some warning signs that may suggest a language problem even in very young children. There are a number of classifications used to describe different types of language disorders. These classifications help clinicians understand what the major symptoms are for an individual child, how to target treatment, and what the likely prognosis is. They will be briefly defined below. Articulation refers to the ability to pronounce sounds, syllables and words. An articulation disorder refers to a condition in which the child has difficulty saying particular consonants and vowels. This makes the child’s speech poorly understood by other people, even though the child may be using the correct words or grammar. Parents are able to understand what their children say well before other people outside the immediate family do. However, most children are understandable to others by 2 years of age. By 4 years of age, children’s speech should be clear to others outside the family almost 100% of the time. Articulation disorders make it difficult to understand what the child is trying to say, even at times for parents. Stuttering is a problem with the rhythm of speech. The child knows what they want to say, but can’t get out the words. This is because they get stuck on a particular sound and can’t move on to the next sound or word. The cause of stuttering is not known. There may be some genetic influence to stuttering. There are studies that suggest there may be a problem with the connections between the 2 sides of the brain that can lead to stuttering. Stuttering often begins between 3 and 6 years of age. It occurs in 0.5-1% of children. Many cases may resolve on their own. However, there are some severe cases that require intensive forms of speech therapy to improve. Even when stuttering resolves, those children are at higher risk for DLD than expected in the population at large. These children may require careful follow up to insure that other language problems are not missed. Speech is limited to single words, with great difficulty getting out several words in correct order. The words often are expressed with great effort and the child may make several attempts before getting out the word correctly. When severe, this verbal dyspraxia can make it problematic for the child to have functional speech. Alternative means of communication, such as sign language or the use of a communication board, may be useful in facilitating communication and reducing frustration. is the most commonly recognized form of DLD. It consists primarily of the inability to adequately express oneself verbally using appropriate grammar. The child’s speech may not be fluent and they may speak in shorter and less complex sentences than other children their age. Grammar is typically poor and the grammatical errors tend to differ from that of typical children when learning language. is one of the most severe forms of DLD. In this condition, children are unable to understand language as meaningful, even when hearing is entirely normal. They sometimes appear to be hearing impaired because they do not respond to calling their name or to verbal questions or commands. They may have great difficulty with speaking, as well. While they can make sounds or even say words, the words typically do not make sense for the situation. This type of language disorder is often found in children with severe autism, and also in an acquired epileptic condition called Landau-Kleffner Syndrome. is a condition where children may talk a lot and have a large vocabulary, but their speech is superficial. This causes them to have a problem carrying on conversations with others. They may talk about their own interests, often unaware of social cues which would indicate to most people that their listeners are not interested in what they are saying. They may lack the normal intonation in voice that conveys meaning to what they are saying (a quality called prosody). Additionally, they may have monotonous speech or may sound formal when they speak (sometimes referred to as the “little professor”). This type of language disorder is often found in children with high functioning autism or Asperger syndrome. There may be no physical abnormalities associated with DLD. Except for specific instances of genetic disorders that can cause language delay, children with DLD do not have other medical conditions. However, some children with DLD may have problems with controlling the muscles of the mouth. This lack of control can cause chewing difficulties early in life and articulation problems. Excessive drooling can sometimes accompany language delay. Other children may have poor coordination, such as difficulty catching a ball or riding a bicycle. Additionally, they may have problems with eye-hand coordination, such as coloring within the lines or with handwriting. Certain types of epilepsy may be associated with language impairments. A specific defect in brain development, called congenital bilateral perisylvian syndrome, can be associated with severe impairments in spoken language. Some genetic disorders are also associated with language impairments, including Down syndrome and Fragile X syndrome. In these conditions, there are other physical features that suggest to the clinician the underlying diagnosis. There is some evidence for a genetic role in DLD. However, only a few specific genes have been identified as being associated with language problems. There is a higher likelihood of DLD in families where one person already has the condition. For example, there is about a 35% risk of a second family member being affected, while the risk in the general population is around 10%. It is not likely that a single genetic cause will be found for all children with DLD. Rather, there are likely many genes that, working together, are responsible for normal language development. Changes in any of these genes could cause language problems. Attention deficit hyperactivity disorder (ADHD) is a commonly co-occurring condition with DLD. Approximately 40% of children with DLD meet clinically defined criteria for ADHD during early school years. Many of these children may respond to medications that typically treat ADHD. However, it can be difficult to clinically determine whether a child with DLD has a primary problem with attention or whether they are inattentive because of slow auditory processing or impaired ability to understand what is being said (receptive language impairment). For example, if a child is not able to understand what is being said in the classroom, then the child may be inattentive because of the language impairment and not because of ADHD. A careful assessment of the conditions under which a child is inattentive may help to sort out the primary problem. For example, if the child is inattentive when the teacher is speaking to him, but pays attention to visual information such as books, computers or television, then the inattentiveness may be related to the language difficulty. If the child is impulsive, hyperactive, and inattentive whether being given verbal or visual information, then there is a higher likelihood that the child has ADHD in addition to DLD. In this case, medication may be helpful in improving the child’s attention and ability to learn, even in the presence of the language disorder. There is also a strong association between language disorders and learning disabilities once the child reaches school age. Even when the language issues improve to the point of not requiring further therapy, the child may have difficulty in language-related academic areas such as reading, writing composition, and language arts. It is important that children with DLD be monitored closely in elementary school to make sure that they are not falling behind academically. These children should have access to appropriate intervention from the school (see Therapeutic Intervention section below) if they show learning difficulties. Behavioral, psychiatric, and emotional disorders are commonly found in children and adolescents with DLD. Children with early language impairment have a higher risk of anxiety disorder (particularly social phobia). Affected young adults are also at risk for antisocial personality disorder. The severity of the language deficit may predict to some extent the later presence of social anxiety disorders, but this is not definitive. How many words does your child say? Does the child seem to understand what is being said? 3. If there is still concern about language development at that point, the next step would be for the child to receive a hearing test to make sure they are hearing adequately. If they pass the hearing test, then they should be referred for formal language testing by a speech pathologist. During this test, an age-appropriate standardized test of receptive and expressive language will be used to evaluate the child. Examples of these tests are Preschool Language Scales (PLS) or Clinical Evaluation of Language Fundamentals (CELF). The speech pathologist will use the most current, age-appropriate version of the test. If there is any doubt about the overall development of the child aside from language, appropriate developmental or IQ testing might be in order to properly determine whether there is an isolated language problem or more general developmental delay. This would require testing by a child psychologist trained to conduct testing in young children. If the child has unusual facial features or other physical characteristics, genetic tests might be ordered. If the child has other abnormalities on the neurologic examination, such as an unusually large head or differences in function between the two sides of the body, an MRI of the brain might be requested. A history of seizures or convulsions that would indicate an electroencephalogram (EEG) should be completed. Children with verbal auditory agnosia are at risk for having Landau Kleffner syndrome; a sleep EEG should be considered in these individuals. Insurance may not cover all of the tests mentioned above. In general, a pediatric neurology consultation will be covered. Also, an MRI and EEG would be covered if there is a clinical indication provided. Speech and language testing is not always covered by insurance and may depend on the insurance provider and the specific policy. The same is true for psychological testing. Parents will need to check with their insurance provider to determine coverage for these items. Once the diagnosis is confirmed and other conditions, such as epilepsy have been excluded, there may not be any need to repeat the tests in the future unless there is some unexplained worsening of the child’s condition or if new symptoms arise. Extra attention in the classroom to ensure they have understood the lessons and the homework assignments. This is particularly important if the teacher is doing mostly oral instruction. Availability of assignments online or in written form. Extra time for tests (due to the fact that their processing of written information may take longer than usual). If a child with DLD also has attention deficit disorder (ADD), treatment with medication should be considered to improve focus and attention. Psychological counseling may be helpful for those children and adolescents who have secondary psychological problems, including depression, low self-esteem, and frustration. Many children with DLD improve in their language ability by 6-7 years of age. However, even those who seem to get better may continue to have challenges that show up in slightly different ways. Academic difficulties, particularly with language arts, reading, and written composition, present new challenges for the child with DLD. Learning disabilities are estimated to be present in 50% of children with an earlier history of DLD. Attention deficit disorder, sometimes without hyperactivity, co-occurs in 40% of children with DLD, and may cause additional challenges to learning. Frustration over the academic challenges may lead to feelings of low self-esteem, depression, and acting-out or oppositional behaviors (e.g., “I hate school!”). Emotional problems, particularly anxiety disorder, social phobia, and depression, occur at a high rate in children and adolescents (from 20-50% of children with a history of language impairment). Most importantly, language and communication problems may persist into adult life in up to 90% of cases. This persistence may cause the person to be shy in social situations and reluctant to enter into conversations with others. Individuals with DLD may have a lower than expected level of educational achievement than their siblings and peers. Long-term outcome depends partly on the type and severity of the language disorder. It is thus very important that children with DLD have ongoing monitoring throughout childhood and adolescence. Early recognition and adequate psychological, social, emotional and educational support can reduce long-term complications. There is no way to completely prevent a child from having a developmental language disorder. However, since the use of cigarettes and certain illicit drugs during pregnancy has been associated with an increased risk of DLD, a woman should avoid these substances before and during pregnancy. Although there are no other known preventive measures, early recognition of the problem when it occurs is important in having a positive outcome. If a language disorder is suspected, parents should first consult their child’s primary care provider. A referral to a speech-language pathologist may be necessary. A consultation with a pediatric neurologist may be helpful in making the diagnosis, as well as checking for other neurologic conditions that might cause language delay. The public school systems (in most areas) have preschool programs for children 3 years of age and up who have special needs, such as language delay. Head Start programs may also provide preschool support for young children. The American Speech-Language-Hearing Association is a national organization for speech-language pathologists. Their website can provide information on symptoms, as well as other resources that may be available. The parent’s attitude towards the child with a language disorder is important in helping the child. It can be frustrating for a parent to talk to their child and find that the child didn’t “hear” what they said, or didn’t seem to be paying attention. It is important for parents to provide positive support for the child and to have patience with their speech and language challenges. Apraxia/dyspraxia: inability to carry out a voluntary action in the absence of paralysis or loss of sensation (verbal apraxia refers to inability to get words out correctly even when the person knows what the word is). Auditory processing: the ability of the brain to take sounds coming in through the ears and carry them to the brain centers that can make sense of what was heard. Developmental dysphasia refers to a dysfunction in the development of speech and language expression and/or reception, in the absence of other problems such as hearing impairment, muscle weakness, global intellectual disability, or other specific neurological disorders. Specific Language Impairment. In D. G.Amaral, G.D. Dawson, D. H. Geschwind (Eds) Autism Spectrum Disorders. Oxford University Press.